Welcome to the brand new Quality Hotel™ The Mill, now ready to add some spice to Malmö! Enjoy the hotel's great location on Amiralsgatan near Triangeln and Möllan, as well as 224 rooms, several conference rooms, a Brasserie X restaurant and The Mill Bar. Quality Hotel The Mill is now ready and waiting to welcome you after a full-scale renovation! The hotel is located on the corner of Amiralsgatan/Föreningsgatan, just a stone's throw from the popular district of Möllan in Malmö. Guests can look forward to 224 hotel rooms of various sizes spread across 13 floors. The ground floor is home to our new cocktail bar, The Mill Bar, which even has its own entrance. On floor 2, you'll find one of our popular Brasserie X restaurants. Other facilities include a modern gym and a parking garage right under the hotel. Quality Hotel The Mill is located on Amiralsgatan, a stone's throw from Malmö's popular Möllevången district, or "Möllan", as it is colloquially called. There you will find numerous restaurants, pubs and nightclubs. The delightful Folkets Park, with fun for the whole family, is just a few streets away. It is just under a kilometre’s walk to Gustaf Adolfs Torg and Lilla Torg or there are city buses right outside the door. In the hotel lobby you will find The Mill Bar where you can have a drink and dinner – an ideal gathering place for both Malmö locals and visiting hotel guests. At Quality Hotel The Mill you will also find the Brasserie X restaurant concept, which is a lunch and à la Carte restaurant that makes good and uncomplicated dishes from scratch. Are you organising a conference in Malmö? We have 10 great meeting rooms, the largest of which can accommodate up to 150 people. Go ahead and book your next conference or meeting right here with us. And guess what? At a Quality Hotel, you always have popcorn and ice cream during your conferences! If you’re coming from Sturup Airport, you can easily take the airport bus as it stops near the hotel. If you want to travel to or from Kastrup Airport, or you're planning a visit to Copenhagen, you can take the Öresund train over to Denmark! 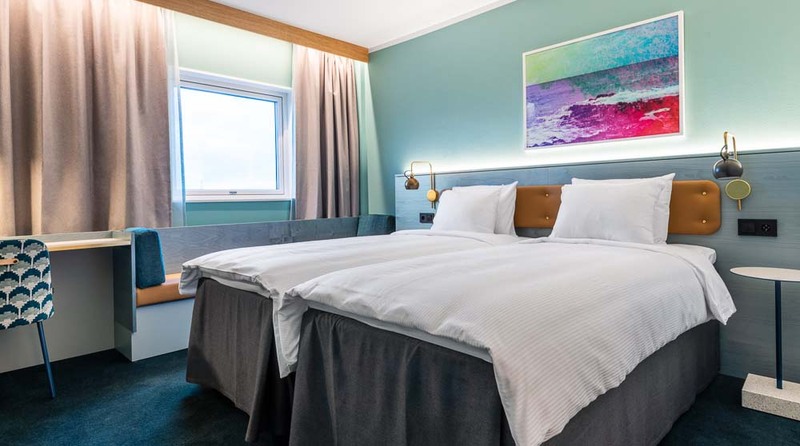 It takes just 30 minutes to reach Copenhagen and 15 minutes to the airport from Triangeln train station, which is about 200 metres from the hotel. Guests are welcome to use our large parking garage located under the hotel. The entrance is located on Gustav Möllers Gata. You can park your vehicle here for 200 SEK/24h. Quality Hotel The Mill has a total of 224 hotel rooms, 444 beds and 23 sofa beds. Several of the hotel's double rooms also have a connecting door between them, which makes them ideal for families or other large parties.